A senior Housing Executive official has said not enough social homes are being built to meet demand in the north-west. The executive plans to build 1,300 homes by 2021 in Londonderry and Strabane. But last year 1,200 households - individuals and families - were accepted as homeless in the council area. 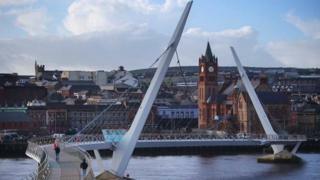 The figures were revealed at Derry City and Strabane District Council meeting on Tuesday. Eddie Doherty the executive's local area manager told BBC Radio Foyle: "We came to the council yesterday and fully admitted that the maths doesn't add up. "Last year, 2017/18, there were 269 houses completed. This year we have 866 homes being constructed and as we go forward over the next two to three years we have a further 1,300 properties in the plan." Mr Doherty said the executive was curtailed by a number of factors, including the lack of a functioning government at Stormont and a shortage of available land for social housing. He said it had been made clear to local representatives that "there needs to be a major discussion in relation to the supply of social housing in this city and beyond in terms of whole of Northern Ireland". Councillors have said there are a number of concerns with the three-year housing plan outlined at Tuesday's meeting. DUP David Ramsey said the executive's current strategy falls short. "It doesn't deal with the current issue that there is somewhere in the region of 4,000 applicants for social houses but a massive shortage of available houses," he said. Mr Ramsey said the housing shortage was nothing short of a crisis. SDLP councillor Brian Tierney said there were currently more than 400 complex housing needs assessments waiting to be processed in an area that spans from Newtownabbey to Strabane. But, he said, only one specialist housing officer has been allocated to look at them. "This is an important role which seeks to help support the most vulnerable people in our society. "Failure to address this increasing case load is, in my opinion, an inequality in the service for disabled people. Independent councillor Darren O'Reilly said he deals with people in housing stress "day in and daily". "But the lack of homes is only one factor. Often it is people who are most vulnerable , who have complex needs who are being left behind. "We need to properly resource the Hosing Executive and allow them to build, to make sure there is affordable houses for people in this city," he said.